My data source in this post comes from Transport for London’s excellent developer feeds, where if you sign up, you can access live updates of the positions of every bus in the city. How cool is that? I thoroughly encourage you to go and have a poke around, if that’s something which takes your fancy. I’m using here Python (sorry Matlab), and the Matplotlib and Seaborn plotting modules, along with Numpy for the occasional bit of numerics. Surprisingly, the bus network is so dense that it’s actually fairly difficult to make out the layout of the city. My main guiding features are the blank space corresponding to Richmond Park in the south west, and the characteristic (and bridgeless) loop of the Thames around the Isle of Dogs to the east. There are a few errors in the plot (the long straight sections), but it’s really just meant to give you the impression of how dense a good public transportation network needs to be in a big city. If we just look at every single arrival time at every single stop, we can bin those arrival times into bins spaced by 5 second increments and plot the resulting histogram as the blue curve above. 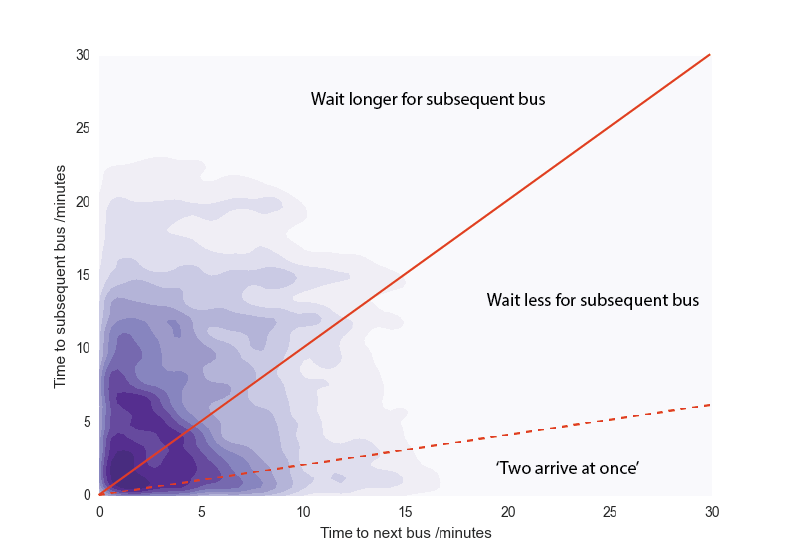 This is multiply-counting buses, as they may appear as arrival times on several stops, but it should serve the impression that there is a near-constant stream of buses arriving at bus stops on average. This, however, isn’t what the impatient commuter wants to know. Presumably they are waiting for a single type of bus, and would like to know for a particular stop how long until the next one (there may be multiple buses a commuter will want, but we’ll ignore that possibility for now). The green histogram therefore only includes, for each stop and each route servicing that stop, arrival times for the next bus of that route. This has a distribution which is much more like what we’d expect – odds are the buses will arrive sooner rather than later. In fact, the distribution looks convincingly exponential which we’ll come to later. 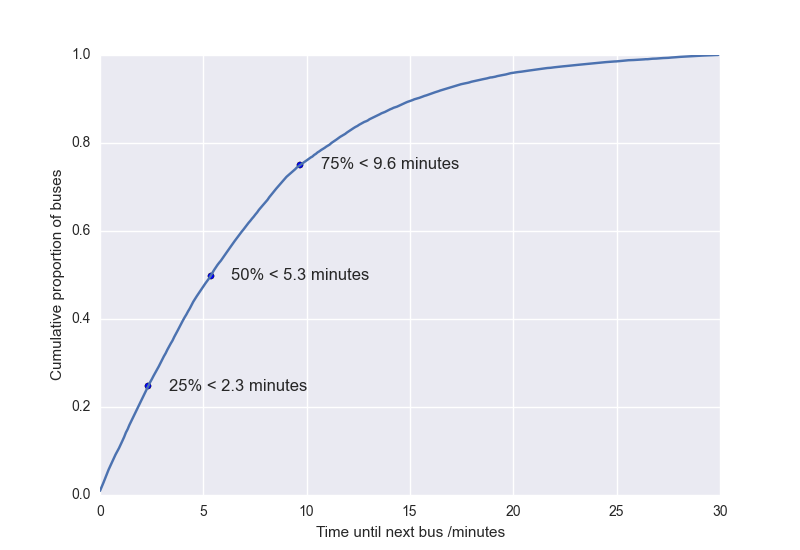 I’ve labelled a few useful points – 50% of buses arrive within ~5 minutes, 1 in 4 arrive within ~2 minutes, and 3 in 4 arrive within ~ 10 minutes. By the time you’ve been waiting 20 minutes, your bus is now in the bottom 5th percentile of punctuality, and worse is probably packed and smelling of fried chicken. These are all pretty solid stats for TfL (especially compared to other cities in the UK), but they’re really not what we care about at all. We would like to know why so many buses arrive in twos, or threes, after waiting ages for a single one. I mean, what are the odds? This is another question we can answer with our lovely data, and is plotted attractively (though with questionable utility) as a bivariate kernel density estimation below. Darker colours correspond to a high proportion of buses in that region of parameter space. As we saw above, most buses are concentrated near a short waiting period and drop off exponentially. 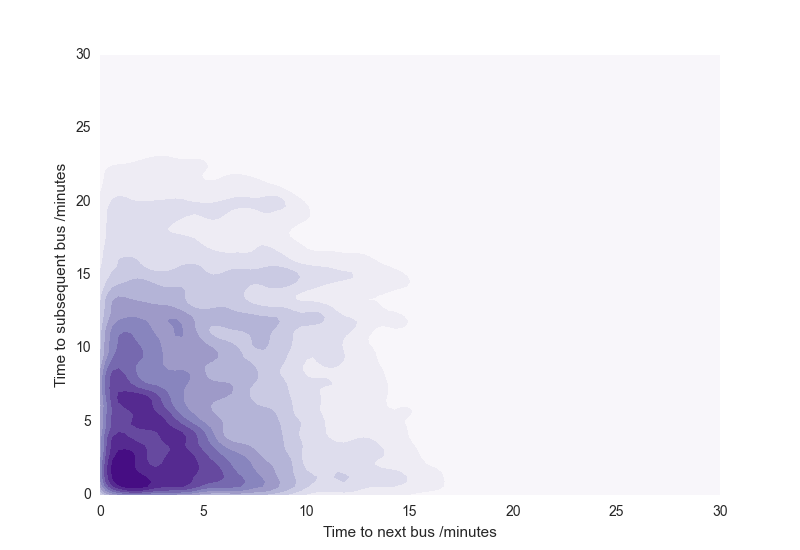 There are some obvious peaks for differences in bus arrival times of 8, 12, 15 and 20 minutes, the standard intervals between the buses on most routes. 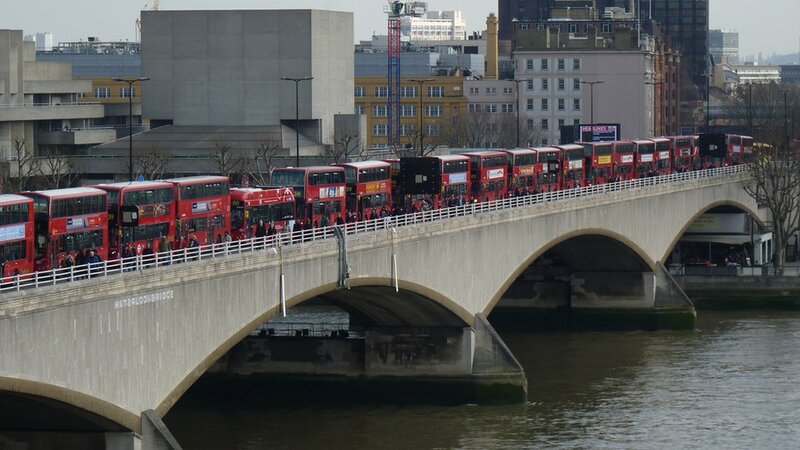 Scandalously however, there are a significant number of buses for which the next one will arrive in > 10 minutes, and the subsequent one will arrive in less than 1 minute! Also, a lot of buses are arriving in a configuration where the first is arriving in less than 5 minutes, but so is the subsequent. Shouldn’t the bottom left of the plot be a bit more ‘thinned out’ if the buses are meant to be evenly distributed? Here we need to turn to a bit of statistics, as our brains aren’t great when it comes to intuiting things like probabilities. The clue should come from the exponential shape of the ‘waiting’ distribution of the bus arrival times above. Though buses are ‘injected’ into the road network at uniform intervals, they are perturbed by traffic and bus stops and so can be thought to ‘thermalise’ into a less uniform distribution. Great! 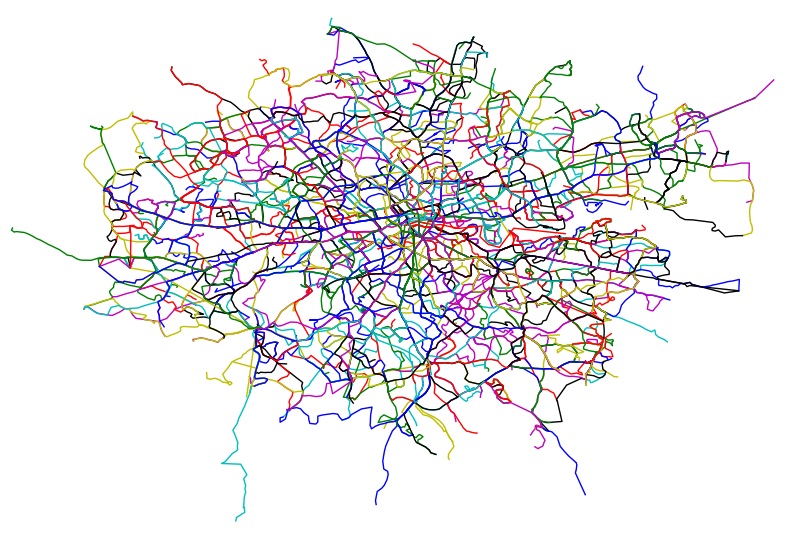 This is the distribution we observe in the real London bus network, and indicates the underlying bus arrival process is Poisson (and therefore is about as random as nuclear decay). 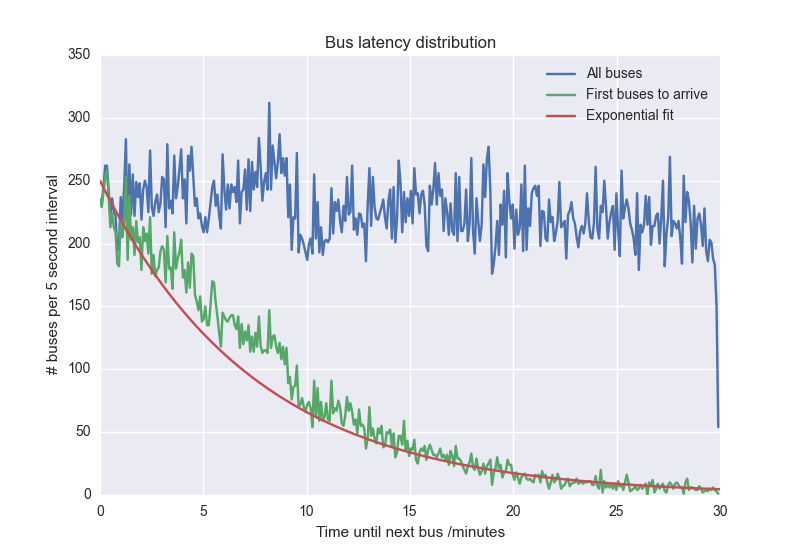 From the exponential fit we get buses/minute, or one bus every 7.5 minutes on average. This is about what I’d expect given the standard London bus timetables. which is exactly the same as if we’d only just arrived at the stop! This lack of memory means that at a given time, a Poisson process doesn’t depend in any way on the history of events, but just the time interval from now. a nice simple result. The odds that the next bus makes us wait at least as long as the first is 50% as we might imagine. 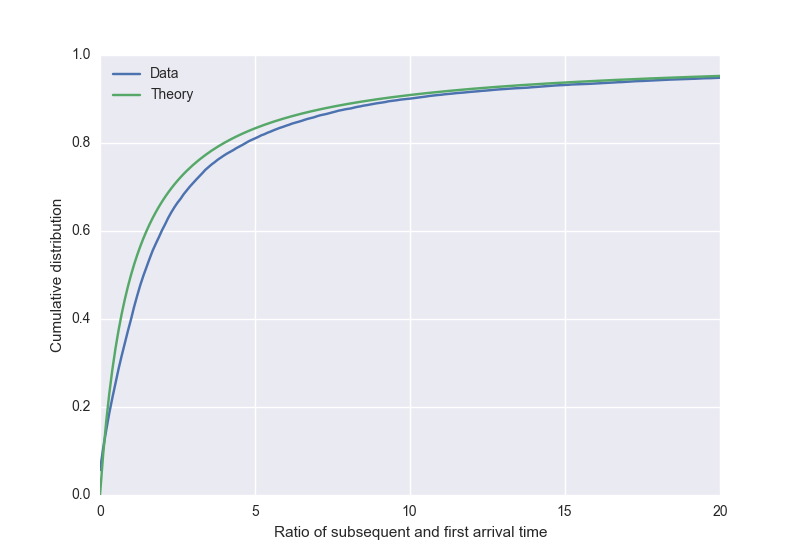 The odds that the next bus will arrive in a time less than one tenth of the first is around 9%, which is quite a lot! One in ten bus journeys may conceivably be plagued by the ‘two at once’ curse then, by our model anyway. That’s not a bad match! Unfortunately for us, we’ve now compounded our evidence that the bus network, at least in a dense highly-perturbative road network such as London’s, is effectively random. +1 for statistics, -1 for getting to work on time. I’m not sure if the conclusion is correct. Each bus route has different service frequency: some routes have buses every 5 minutes, some every 30. It’d be more correctly to plot deviations from expected arrival of a bus to each stop. For example, route X has buses leaving every 10 minutes. Theoretically, those buses should arrive to each stop of that route every 10 minutes. But they probably don’t. I’d expect that variation be normally distributed around 10 minutes. That could be normalized across all routes with different bus service frequencies. You’re right, saying something is ‘random’ because it approximately fits some distribution is too strong a statement to make, it was really more of a joke as the suffering commuter suspects the buses are arriving randomly. It would be interesting to take a more structured approach, perhaps start the buses periodically and allow them to diffuse slightly, then examine the resulting distribution. What happens if you restrict your analysis to rush hour? In my anecdotal experience, two buses or trains arriving in close succession is primarily a rush hour phenomenon. The first bus gets full so boarding/leaving the bus gets slowed down. The second bus doesn’t have that problem so ends up getting stacked right behind the first bus. Good question. This is an instantaneous snapshot of the bus network taken on a weekend afternoon. It would be interesting to compare how the distributions change throughout the day/week. But buses are not independent! They share routes. If a long time passes between one arrival and the next, people will accumulate a a given stop; when the next bus arrives, they will take some time all to get on. The next bus along that route, if it arrives after a more typical time, will find the stop much less full; it will take less time for those people to get on, and the bus will move along much more quickly. Similarly, a fuller bus will stop more often and for longer as people get off, and an emptier bus will stop less, and may even skip stops—leaving more time for people to accumulate at stops in front of the full bus, and less for the emptier bus. It’s the same effect as the ‘two trains five minutes apart’ problem, only in a vicious cycle: the result is a very full bus, moving slowly, and picking up all the passengers for its route at each stop, and a nearly empty bus coasting along in its lee (and buses passing each other does not happen often). A very interesting analysis! I think about this frequently (while waiting for the bus, of course). I’m actually surprised with your results, since there’s a very simple reason for several buses of the same route to bunch together. If the first bus is slightly delayed, there will be more people waiting for it and each stop will be longer, making the bus more delayed. If the second bus is slightly ahead, the opposite happens. I’d really love to see this for a weekday and during rush hour. A minor thing, though: It may be because English is not my first language, but I found it very hard to understand what you meant by subsequent/next/first/etc bus. Maybe you could add a few sentences to clarify the terms?